It’s by Mena Boughey – who runs cooking classes in Lavenham (Suffolk) and runs a catering company–lucky Lavenham! She emphasizes the importance of introducing spices in small batches–giving each spice time to settle in and release its aroma. Taking time under the big Suffolk skies–the zen of curry! She includes a tablespoon of fenugreek–a regular spice in the Indian kitchen with links, as the name implies, to the Mediterranean and like many spices, claims interesting health benefits (good for digestion, good for diabetes). 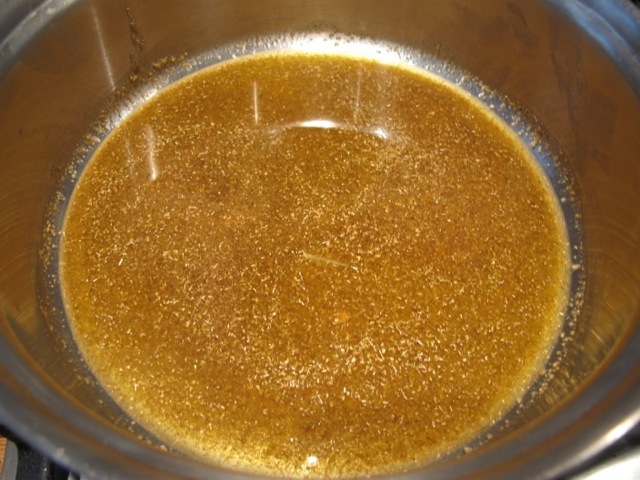 Heat the oil in a medium pan and add the fenugreek, cumin and coriander. Cook for a couple of minutes on a low heat until they release their aroma. 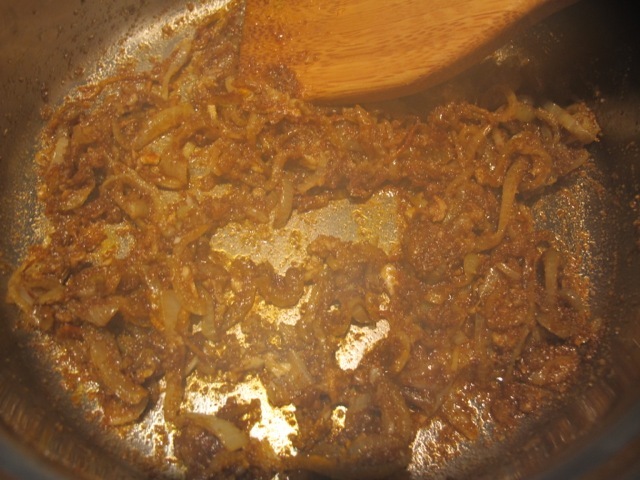 Add the onion and turn it over in the spices and continue to cook until it starts to soften. Add the cayenne/chili and cook for a couple of minutes. 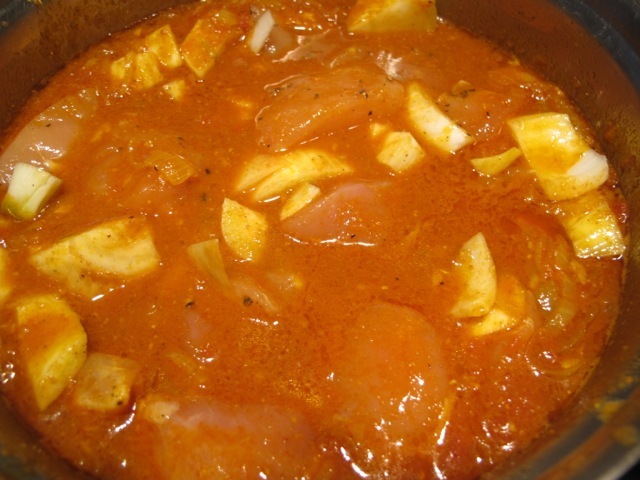 Add the garlic and ginger and cook on for 5 minutes–being careful not to let the spices burn. 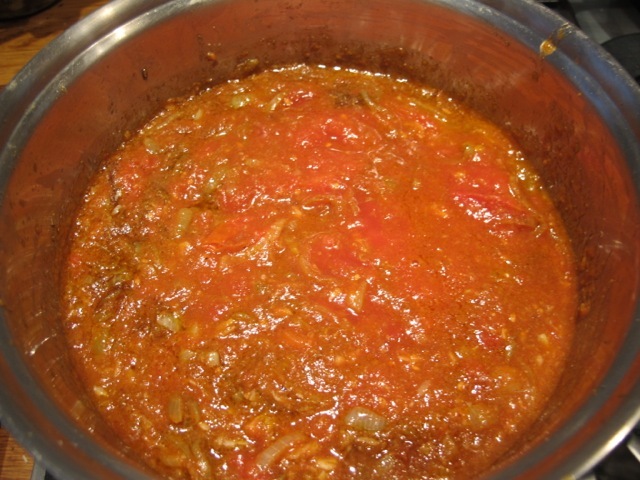 Add the tomatoes to the mix and let them meld in and the liquid reduce–about five minutes. Add the turmeric and stir it in. Add the chicken and fennel pieces and enough hot water to cover them. Bring slowly to the boil then turn the heat down low. Cook at a light bubble until the chicken is cooked through and the fennel is tender. Turn off the heat and leave the flavors to take meld. Before reheating it fold in the yogurt. Meredith went to the larder in search of chutney the first time I made this. So I made a quick sauce with yogurt and cumin. Mmmm can almost smell it from here Robin. Glad to see the curry stains on your cookbook, looks just like mine! Sounds marvelous – although I prefer Mexican food to Indian. 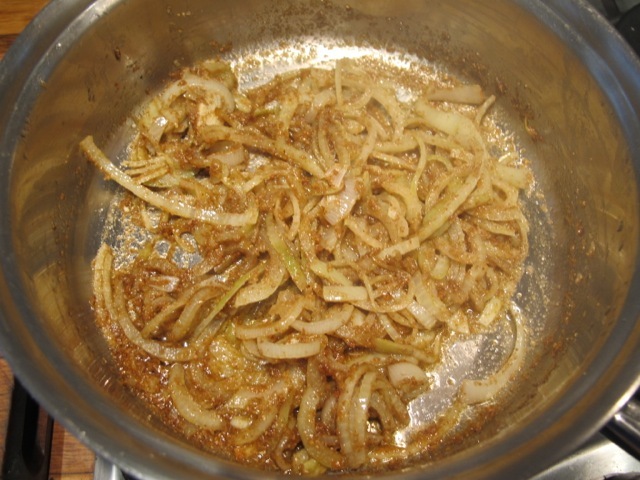 Could leeks be used rather than onions? By the by, how is Midnight settling? Is he carving out his niche in the household? Try leeks–they are delicious anyway, though they don’t have the same edge to give to the flavor. Midnight is calming down and the pecking order is reestablishing itself! Mmmm can almost smell it from here Robin. Glad to see your cookbook splattered with curry stains, looks just like my cookbooks! That looks a lovely recipe. I shall try it next time instead of my usual mix. What’s your usual mix, Chris..? Your emails are much appreciated, and your recipes are fabulous! But I want to know how ANYONE could even THINK of re-doing Poldark without you in it! There just couldn’t be a Ross Poldark who isn’t you. (bad grammar). Looks great. 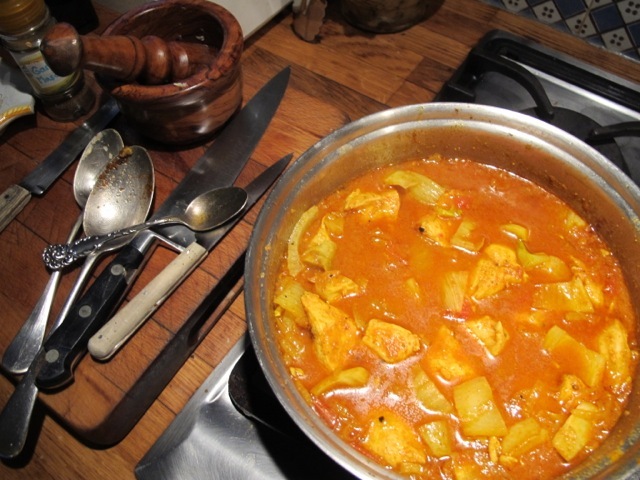 I love a simple curry, can’t be doing with long lists of ingredients. Like the substitution of fennel, my favourite veg. Sound delicious. How large are the tins of tomatoes? Just 3 or 4 toms! I had curry turkey two days ago, but next time I will try this one as I see that it is slightly different. 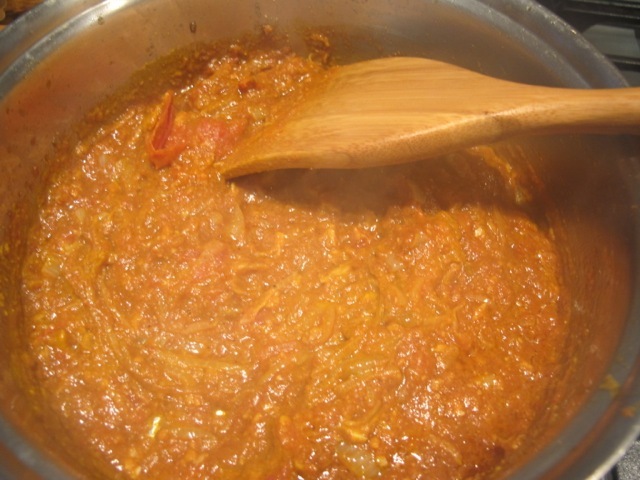 I use a prepared curry mix (usually mild) and do not put any tomato, garlic and ginger, as well as no garam masala. Instead of water I put vegetable stock. And at the last Greek yogurt and half a lemon squeezed. I can’t wait to try this. 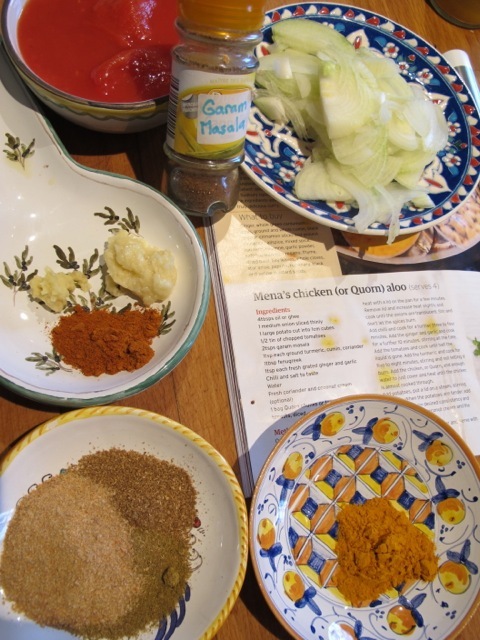 I was just going to head to the Indian market to get ingredients for a methi bhaji my wife makes that I love with baked fish and I decided to see what Robin Ellis does with fenugreek first. Thanks for reminding me about the chutney. I’m out. The chutney my wife made last year was wonderful, but they have a really great garlic pepper chutney at the market I’m going to. I hope you do try methi bhaji. It’s sort of a generic name like “spinach salad.” My advice is search for “methi bhaji” or “methi sabji” with a list of ingredients you would like (garlic, onion, whatever) and find a recipe that way. My wife’s recipe uses gram (chickpea) flour. 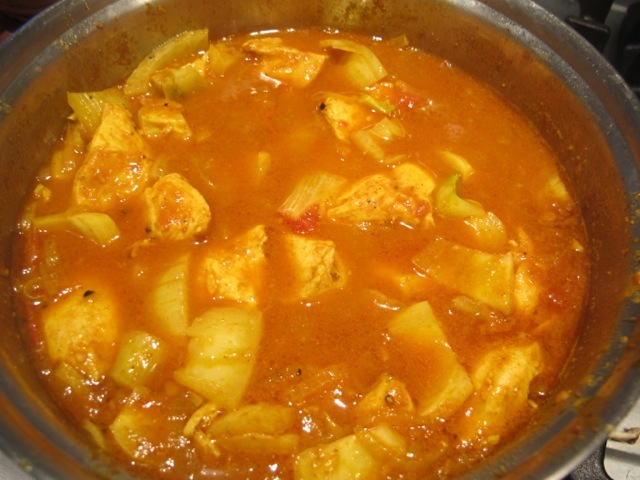 Recipies with “aloo” in the title will be heavy on potato – which I shouldn’t eat. I tried your curry, Excellent! I played with the spices a little, doubled the garam masala, added 1 tsp. fresh dry roasted cumin seed, etc. but other than that I left it alone. 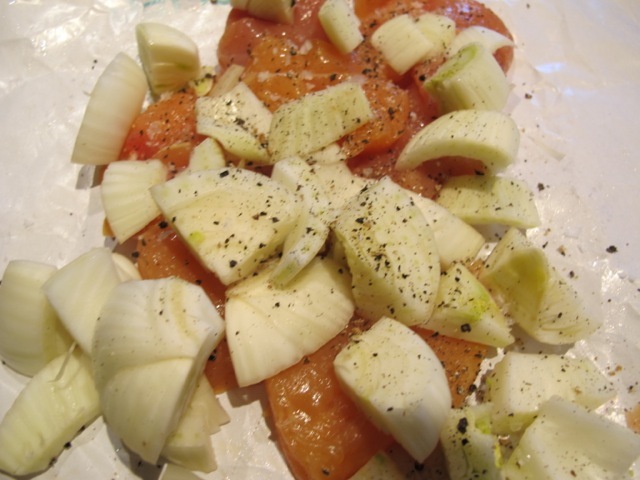 I considered using kohlrabi (my usual potato substitute) in place of the fennel bulb but decided to try the bulb. That bulb turned out awesome! The texture was great, BETTER than potato! Thanks. A winner! Things have changed here in England in last few years. In the city, I can see many obese people who can hardly walk. Hello Valerie–well I have been distracted and busy and the blog has got side lined. I am anxious to start up again so stick with please! Happy New year meanwhile!